I met another cat-caring neighbor named Joe this week because he contacted Tree House Humane Society looking for TNR assistance. Tree House introduced us through their Feral Friends network. I was happy to meet Joe because he lives next door to the Frontier Colony, which I TNR’ed in 2009. Tree House admitted two of these cats into their shelter this year. The Frontier Colony is also just one block over from the Peacock Colony. At this point I thought I knew most of the cats in this area, but Joe has been seeing even more. So far Joe has adopted two other cats from his street, and can not keep taking more in, so we decided to trap in his yard this week. One of the cats we trapped needs to be TNR’ed, but he has an upper respiratory infection and is on antibiotics first. He also has wounds on his back so we’re glad we could give him this much needed medical attention. We trapped another cat who was already eartipped. We named him Tang and decided to bring him into the clinic for booster shots and to trace the microchip. It turns out this cat was TNR’ed by me a year ago, six blocks away, for another colony caretaker who free feeds in her garage. I love microchips because they always reveal more pieces to the puzzle. The only thing better would be kitty cameras to really track these cats. Somehow a year after being TNR’ed Tang made it to Joe’s house, which requires crossing a fairly busy street. Tang has turned out to be incredibly friendly. He head-butts everything, rolls over for belly rubs, and meows for attention. He also eats anything you put in front of him immediately. One can of food after another. Tang is hungry, and probably not used to eating regularly. He has lost weight since he was first TNR’ed. It’s no wonder he traveled across a busy street from one feeder to another. Tang is available for adoption. 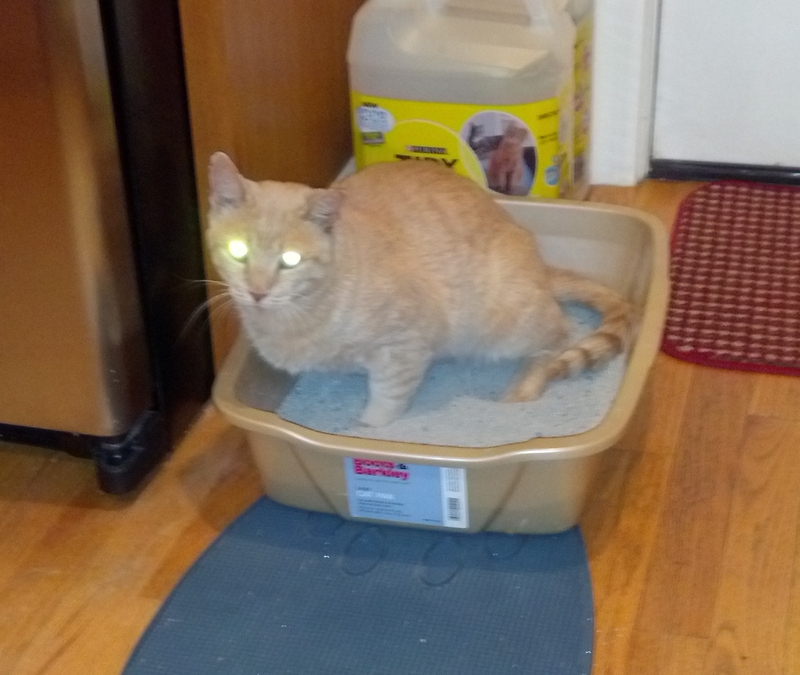 Here he is showing his skills in the litterbox and laser vision.